1. Preheat the oven to 200°C, gas mark 6. Check the fillets for any excess fat and trim if you need to. Mix together the coriander, cumin, salt and oil, and rub over the fillets. 2. Place on to a baking sheet and roast in the preheated oven for 35-40 minutes until the juices run clear and there is no pink meat. Leave to rest for 5 minutes. the vinegar, curry powder, Nigella seeds, a generous pinch of salt and 150ml water. Simmer for 15 minutes until the shallot is tender. 4. Next, add both the Bramley and Braeburn apples, then cover and cook for another 10 minutes until just starting to soften. 5. Scatter in the sugar, stirring to dissolve, then bubble for 10-15 minutes until the mixture is jammy and thick. 6. 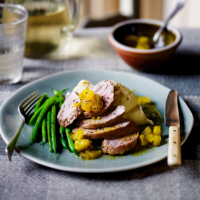 Slice the pork into medallions and serve with the apple relish and seasonal green vegetables. Non-reactive saucepans are those made from stainless steel, glass orceramic, or 'Teflon' coated.